There has been a lot of concern and uproar recently about the .NET Framework Assistant Firefox Add-On (plug-in), that Microsoft silently installs with the Microsoft .NET Framework 3.5 Service Pack 1 (which was pushed in early 2009 with Windows Update). As such, if you are using Firefox, then there this is a very high probability that you have this Firefox Add-On installed, maybe even without knowing it. There are dozens of blogs that complain about the security implications, how the Add-On cannot be uninstalled and eventually post instructions on how to remove the Add-On from your computer, essentially implying that the AddOn harbors major security risks. Contrary to most Firefox Add-Ons, this one can’t be uninstalled through the browser since it was installed at the “computer level”. As such, you have to remove files from the file system and modify the Firefox configuration to disable it. Microsoft installs .NET AddOn without user approval! AddOn silently runs .NET applications without user knowledge! ActiveX security hell is back! So is the AddOn a security risk and do you have scramble to rip it out? Not in my opinion, and I will explain why. In this post I will clear up some misconceptions about the ClickOnce technology, but also show you how to remove the AddOn from any number of computers with a few clicks – using our new AutoAdministrator 2.0 – just in case you do want to rip it out :-). What most people don’t know, is that the ClickOnce “technology” is already present in Internet Explorer, and is not even close to what was/is possible with ActiveX applets. So the AddOn is really just a gateway into something that is already on your system in the first place – .NET. Java does the same thing, and the AddOn Microsoft provides is likely much leaner than the Java plugins – and doesn’t register a new plugin with every new Java update that is released. Don’t get me wrong – Microsoft could have handled this much better, and the inability to uninstall the AddOn really doesn’t help their case. Oh, and by the way, to see a sample ClickOnce application then you can click here. It’s hosted by the author of the FFClickOnce Firefox AddOn, a predecessor of the .NET Framework Assistant if you will. Having said all that, you might still want or have to remove the AddOn from multiple computers if you need to remove the ability for your users to run ClickOnce applications from Firefox. The good news is that you can remove all files as well as all registry entries that are associated with this Add-On from any number of computers within a matter of minutes — using AutoAdministrator. AutoAdministrator integrates with ActiveDirectory, and lets you query/modify files, services, registry entries and more on any number of computers with the click of a few buttons. Read on to find out more. 2. In the Firefox preferences (about:config), right-click the general.useragent.extra.microsoftdotnet property and select “reset”. 3. Delete the folder %SYSTEMDRIVE%\Windows\Microsoft.NET\Framework\v3.5\Windows Presentation Foundation\DotNetAssistantExtension\DotNetAssistantExtension. 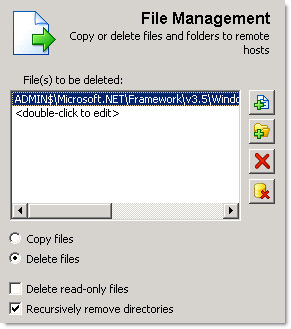 We can accomplish (1) and (3) with AutoAdministrator, which does remove the Add-On. It doesn’t reset the setting inside Firefox (2), but that should be merely a formality without the actual plug in. Our tests have shown that the plug in is gone after deleting the registry key and the directory on the file system. There are two prerequisites for this to work: Your remote machines need to have the remote registry service running (you can temporary toggle that too with AutoAdministrator if it’s not running!) and the ADMIN$ share needs to exist. 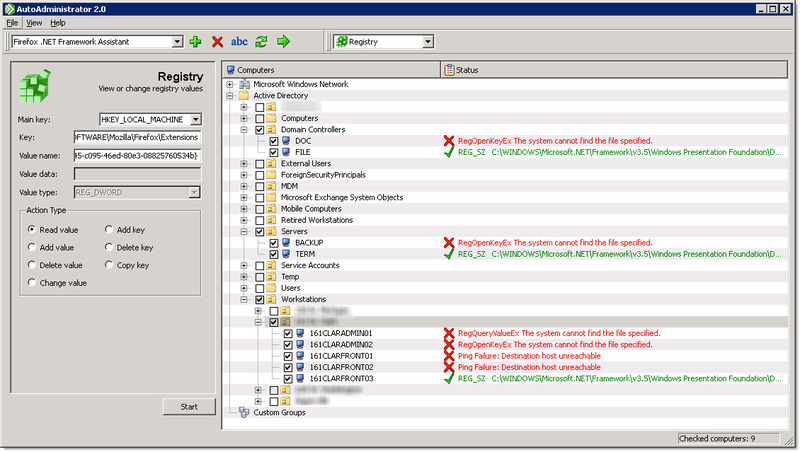 As with all things you can do with AutoAdministrator, you should be very careful. We cannot take any responsibilities if you end up corrupting your Firefox installations, or worse, the Windows OS. So, fire up AutoAdministrator and select the computers you want to uninstall the pesky Add-On from in the right pane. Then, select “Registry” from the toolbar and paste the key from step one in there and select “Delete key”. The screen shot above shows the result list, using the “Read Value” option. To actually delete the key, you would need to select “Delete key”. Machines that are turned off are displayed as “Ping Failure: …”, and machines that don’t have the Add-On installed show a Windows API error message. ettings as a preset, so that you can retrieve these settings at any point in the future with the click of a button. I think if this exercise reveals anything, then it’s that Firefox’s AddOn framework leaves some room for improvement. For example, why did Firefox not inform me that this AddOn had been installed? Skype also silently installs an AddOn, though that can be removed easily. And if you’re really serious about browser security, then you might want to check out the Flashblock AddOn. It disables all flash animations by default, leaving placeholders that you can click to load any flash animation. This improves page load times, can help suppress annoying flash-based ads and of course helps security. I haven’t tested it on many sites yet, but it can quickly get annoying if you’re accessing a lot of web sites that contain reporting widgets that are flash-based.